Stop complaining and think about the bigger picture! The past month as been hectic. To be honest, I got mine 2 weeks before the release date. I was very happy to be the first, that got one from Right Stuf, which resides in the same state I live in…just over 100 miles away. And to be fair, while I was watching it on BluRay, I saw the ghosting and artifacts that the minority have been talking about. Am I upset the quality isn’t perfect? Yes. Did I complain about it, at first? Yes, I have. I pointed out how Viz didn’t deliver on the video quality, as that’s half of what makes the new dub perfect. But I didn’t see why, and even wondered how things could’ve been done. I’ve seen people complained so much, that they want a recall to the sets, asking Viz to make it better than that. Just ask that one reviewer on Amazon. I even went as far, as to reading Kentai’s blog about it. Both may have valid points, but Viz also had valid points on the source material, saying that “they didn’t have an option”, of what masters to go with, and that they try as hard as they can to fix the issues on the masters given. Before I continue, I want to direct your attention to FUNimation, and their “remastering” attempt at DragonBall Z, for their Orange Brick DVDs. Note that FUNimation cropped the original 4:3, and widen the screen, so it fills the black side bars to convert to 16:9. This is a pretty similar scenario, if you ask me. And, I did have the Orange Box sets before. At that time, I never complained about it, and just let it be. That’s before I went on the forums, and seeing how people complained about those; that it’s too bright, removed so much gain that the outlines are removing, etc., etc., etc. At that time, did FUNimation ever fix them? For DBZ Kai, yes…but for their BluRay versions, yes and no. The quality on the recent BluRays of DBZ have the similar situation Viz has with Sailor Moon. Click on that pic below, as that is FUNimation’s BluRay set, and compare it to Kai’s version. Why is it so similar? It’s because both came from Toei, obviously, and video quality is about the same. But, over time, they improve. This pic above was from Season 2 of DBZ on BluRay. On December 9th (2014), FUNimation will release DBZ’s final BluRay release, showing how much it improved in every department, in just a year, since the first set came out on December 31, 2013. Did people complain, during the first sets? Yeah. And, FUNi didn’t recall or anything. They let it ride, and it’ll work out in the end. Which brings me back to Sailor Moon. Now, Viz Media isn’t like FUNimation. In fact, Sailor Moon is Viz’s second classic anime to do the “remastering”, besides Ranma ½. Like Ranma and DBZ, Viz’s remastering of Sailor Moon will improve, in future releases…both in audio and video. Q: What about letting (name other anime distributor) hand Sailor Moon? I’m sure they can do better. A: The problem with that is the how much the series cost to even license. Nobody even disclose the amount, but it’s worth millions, cause Toei’s trying to rebound from the losses, thanks to their children-friendly franchise, Pre Cure. They only have One Piece and DragonBall to work with. Currently, they’re putting Sailor Moon Crystal to use, with the animated series on streaming sites, and its merchandise is a big seller in Japan. Besides that, if the classic Sailor Moon series is handled by a different distributor, it wouldn’t change the situation. We only have 6 US distributors to contend with (FUNimation, Viz Media, Media Blasters, Right Stuf, Aniplex, and Sentai Filmworks). Only 2 are capable of buying it: FUNimation and Viz. FUNimation may be a powerhouse of anime, but they’re focus on what anime can sell, so they can profit off it. As shown, DragonBall Z was FUNi’s first anime’s to distribute, since they existed. Plus, President Gen Fukunaga’s uncle, Nagafumi Hori, was a producer for Dragon Ball, that asked Gen to bring the franchise to America. So, let’s say FUNimation did pick Sailor Moon up, before Viz. They have to remaster the footage, just like they did with DragonBall Z, which means double their workload and pay. Then comes the artwork and designs. Like Viz is now, they have to use the art materials given to them to work with, the production to promote it, and everything else…and all have to be approved by Toei AND Naoko Takeuchi herself. That’s huge pressure, when that company has a HUGE library of anime to also work with. Another thing, if Toei gave FUNimation, or any other distributor, the masters of classic Sailor Moon, the result wouldn’t change, cause they have to contend with the same stuff Viz has, right now. What Viz has now, eases the pressure FUNimation currently has, with over 200 anime series, and growing. Plus, Viz have something to replace the completed anime of Bleach. Q: What about those videophiles that claim that the video quality is worse than Italy or Mexico? They make a good claim on that. A: True. They captured pics of certain areas, and compare it with either the ones from Italy and Mexico. Heck, I seen one that compares it to a FAN-MADE upscale, to prove a point. The problem with fan-made ones is that their source is not from Italy or Mexico. 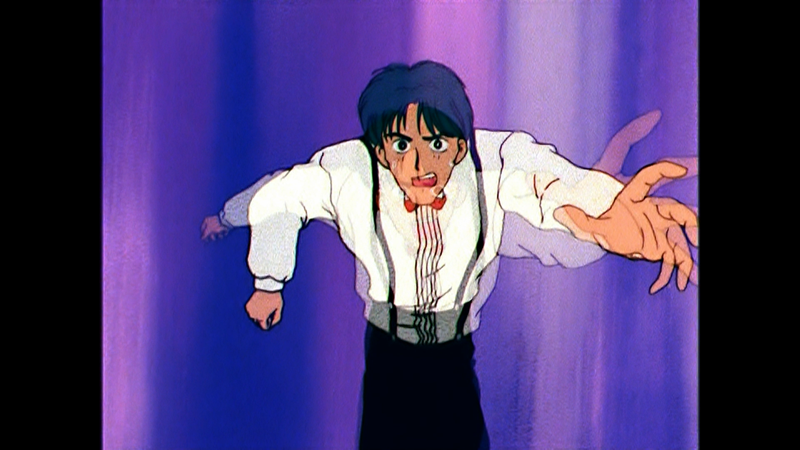 Even some of the screenshots to show the ghosting are a laugh, cause it’s how it is in the episode…just like the Yusuke Amade running pic. Anyway, to be blunt, it’s the norm. It’s the same kind of complaining, when it came to the DBZ sets, and it’s not surprising. The one thing that surprises me is that there’s no petition to tell Viz and say “We demand a recall, so you can fix the ghosting.” I Googled for anything on it…only to find nothing. All I’m seeing from videophiles is a lot of…well…CM Punk, can you help me with this? Yeah. Pretty much a time-wasting, cry-babying thing, when they could be good boys and girls, and let Viz work their way to making it better, like FUNimation did with DBZ on BluRay. After all, it’s just the first release, for GOD’S SAKE! First releases are never perfect. If any videophile want to make it perfect, do themselves a favor and go buy Italy or Mexico’s releases, be a tech kid to merge the Viz dub audio with that quality. BAM! Perfect 10 release! But seriously, these videophile complaints will fade off into the distance. Cause, they’re just a few who think they’re better than Viz…and they’re not. Q: Viz says that they “won’t change anything.” Should I be worried? A: Never be worried. Look at the recent Ranma releases, as they improved on quality over time. Viz says that they won’t change anything, but that doesn’t mean the quality can’t be improved with what they got. They have tons of work ahead of them, and they got plenty of time to improve. After all, this is just the start of Viz’s remastering of the 200-episode series. They got 9 more sets to improve, visually. I think this rant should ease everyone’s worries, and that Viz has some improvement to do. Just like FUNimation with DBZ BluRays, Viz can improve on future sets of Sailor Moon. We should be happy for that.